Study for The Idle Prentice Turn'd Away and Sent to Sea, William Hogarth, 1746-1747, British Museum. 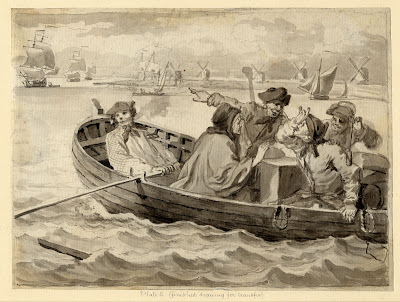 The Idle Prentice Turn'd Away and Sent to Sea, William Hogarth, 1747, Yale University Lewis Walpole Library. 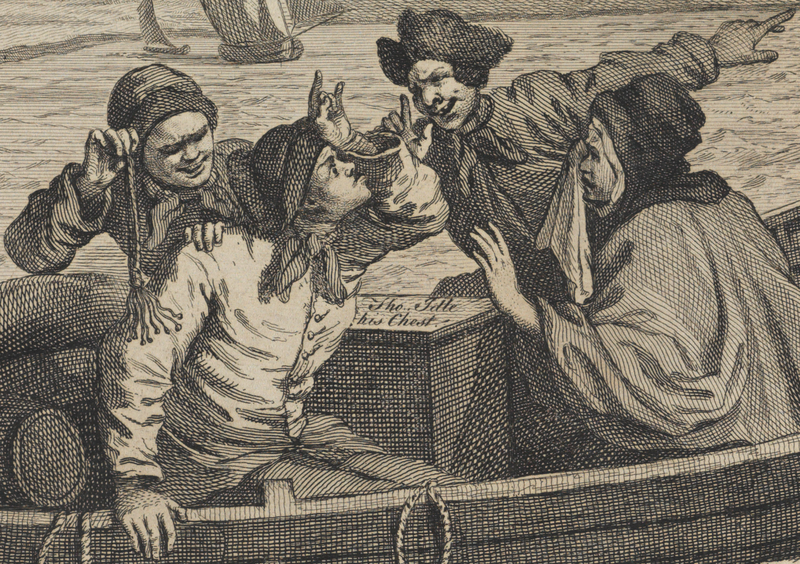 Today's print is part of the "Idle Prentice" series by William Hogarth. 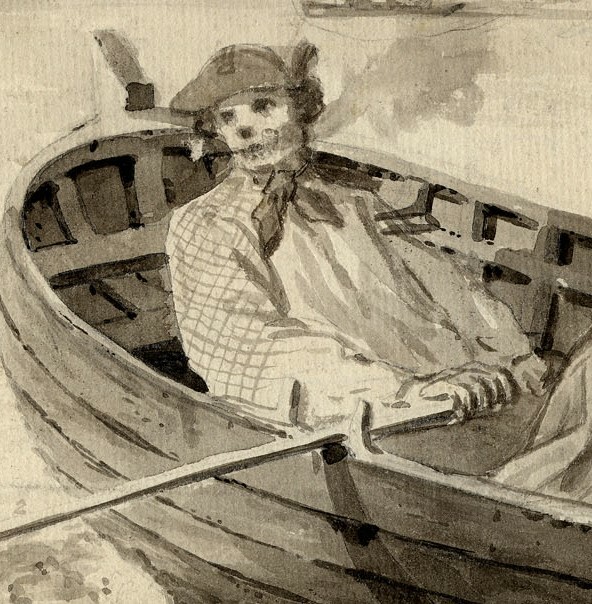 The title character sits beside a sea chest (marked "The Idle/His Chest"). He argues with a pair of sailors while his mother weeps for him. 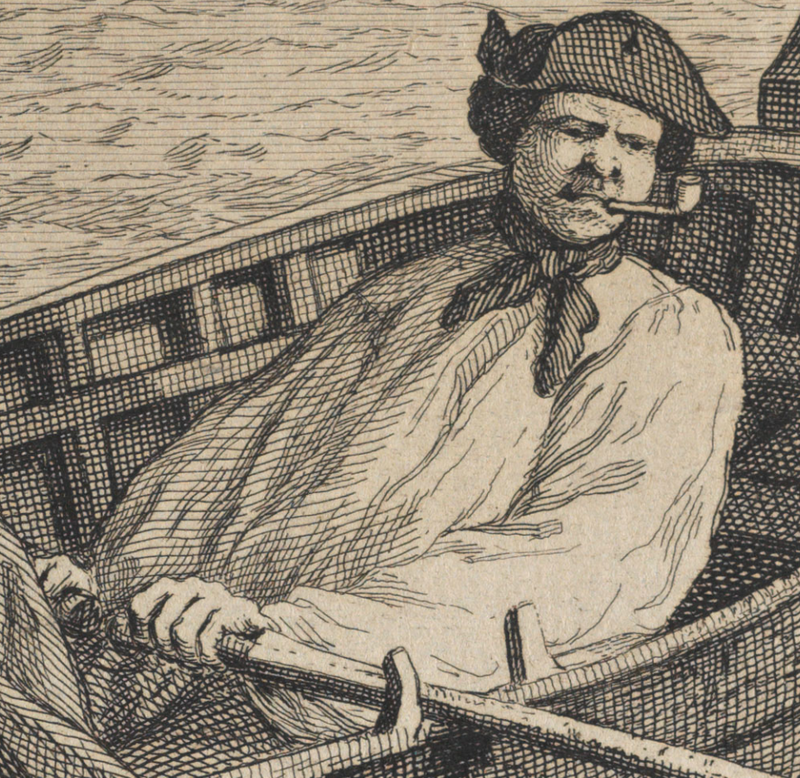 At the bow of the boat rows the only man doing any work: a disgruntled looking mariner with a short clay pipe between his teeth. The Prentice wears a cocked hat, handkerchief, and jacket without cuffs, pockets, or collar. He raises his hand to his head in an insulting gesture: the cuckold's horns. Behind him is a rather vile looking seaman wearing a handkerchief and some sort of short cap. As loose as his sleeves are, and given the smock that both his mate and the oarsman wear, I presume he is also wearing a smock. In the study he dangles what appears to be a sounding lead, but in the final print it has been changed to a cat of nine tails. 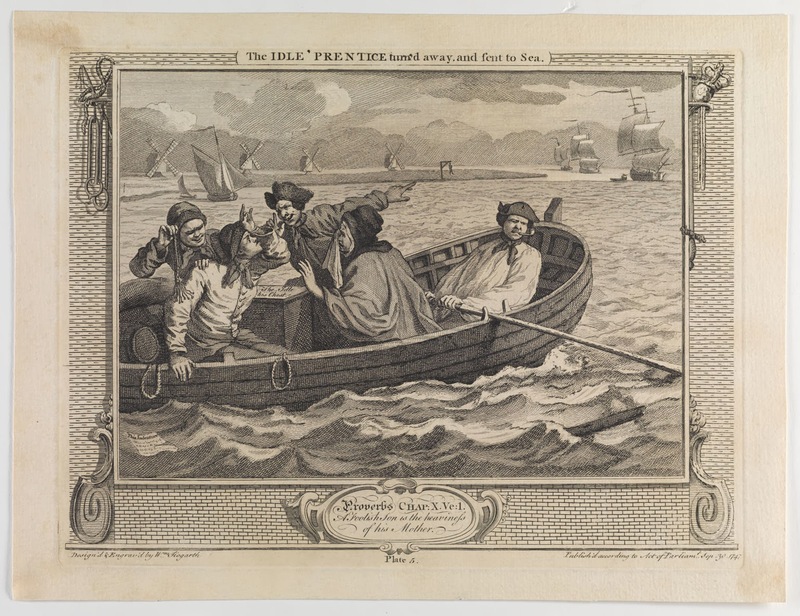 To the right of the Prentice, and pointing away to the gallows ashore, a tar wears a hat that frankly confounds me. At first glance, it definitely appears to be a cocked hat. On closer inspection, it looks parted at the peak. I can't make heads or tails of it, but can confidently say he too wears a smock. At the bow, and looking sick of the argument at the stern, the oarsman wears what is very clearly a reversed cocked hat. There is a simple and small cloth covered button and short loop at the front. He also wears a closely tied handkerchief. On the study, Hogarth made a number of changes: he experimented with putting the clay pipe on one side of his mouth and the other, and he experimented with putting the oarsman in a checked shirt. But the hat and handkerchief remain unchanged. 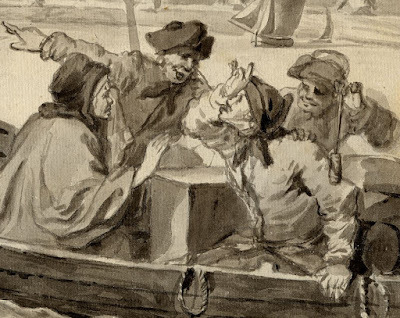 This is strong evidence for the wearing of a reversed cocked hat and closely tied handkerchief being closely associated with mariners.